It’s impossible for me to drive north on Highway 1 between Pescadero and Half Moon Bay and not to notice the bluffs of Tunitas Creek Beach. The sheer cliffs of homogeneous beige-gray rock rise 200 feet from the beach below. The “rock” is actually sandstone, an accumulation of weakly cemented, fine-size sand grains that was laid down ~ 5 million years ago in shallow ocean waters that were less than 150 ft deep. The sediments are similar to what is being laid down in the present day just offshore in similar water depths. 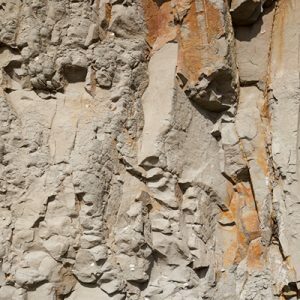 The bluffs are part of a geological formation called the Purisima Formation. The Purisima is found in many places along coastal San Mateo County and extends into Santa Cruz County. In its entirety, it is a few thousand feet thick and was deposited over a period of a few million years between ~2.6 and 7 million years ago. Although that seems like a very long time, it’s mind-boggling to imagine that much fine sand and silt settling out of local ocean waters. Fossils are the critical clue that lets us know these sediments were laid down in ocean waters. 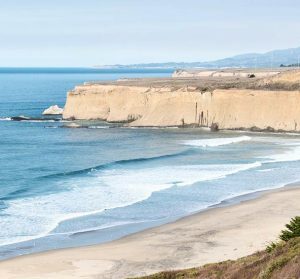 Locally at Tunitas Creek Beach, you can find fossils of ancient clam shells, snails and other marine organisms. They are not super-abundant so you need to look hard. And as the ocean waves continue to batter the bluffs, fossils that have been buried for millions of years are constantly being revealed. The fact that these ancient marine sediments now tower over the ocean is a testament to the active San Andreas system of faults, including the San Gregorio fault just offshore Tunitas Creek Beach. Although much of the movement along the faults is lateral (~350 miles total), there is upward movement as well that has raised the bluffs of Tunitas Creek Beach and built the Santa Cruz mountains. So as you drive on highway 1 near Tunitas Creek Beach, I hope you too enjoy the view created by our dynamic planet and protected by POST. Earlier this fall, POST protected 58 acres at Tunitas Creek Beach. We are now working closely with San Mateo County Parks to open this beach to public access within the next three years. Find the full story here.